…and unpleasant fragrance and, from what I’ve heard, thousands of ground leaks. Sorry. I should never type anything so early in the morning. Yeah mjw, it can’t be great living near this place. Yuck! I am an s4 chemical engineering student at Cape Peninsula University of technology and i am looking for in-service training in your company for next year (2010). This might explain the origin of those ground leaks. looking for work during the current shutdown as a semi skilled labourer.where do i put in my cv? The city has placed green receptacles with slots in the lid at convenient places all over the city. Perhaps try those? Selwyn, unfortunately I have no idea where you could place your CV. Check out http://www.capeads.co.za and http://capetown.gumtree.co.za/ – perhaps you’ll find something there. Best of luck! Hi, I study at Stellenbosch Academy of Design and Photography. We currently have a brief where we have to shoot a landscape. I decided that I wanted to shoot the refinery, what a bad decision! They said it’s illegal, and when I asked for permission they always referred me to someone else…so I found another way to shoot it! Just actually wanted to say that they don’t give good customer service!!! Hey there guys, had such a good laugh at the comment, and the explanation of the ground leaks. Our company worked on the last Chevron 2010 Shut Down, what an incredible place to work, and yes taking photos is very illegal. Thank you for the amazing high quality photo, who can I ask for permission to publish this photo on our website with the article from the shutdown? I am a student at Mangosuthu University of Technology and looking for inservice training in your company.I will apprecaite if you could send me a notification if you do offer this in your company. Sorry for not responding sooner – I must have missed your message somehow. I never realised that it would be “illegal”. I wonder if it really is. Have you posted your photo online somewhere for us to see? 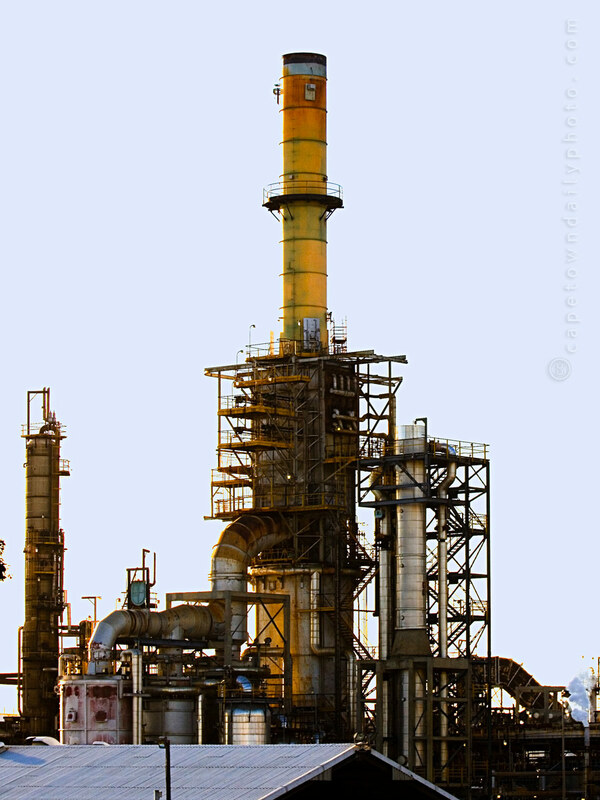 Do you have an idea why it would be considered illegal to photograph the refinery? That’s so weird. You’re welcome to use the photo on condition that you link back to this article. You guys… you must be ripping us off here. Nobody could seriously confuse Cape Town Daily Photo with Caltex. Nice one. Good luck with that job-hunting! Hi Gary – names have nothing to do with my response, and based on my knowledge of mjw, nothing to do with theirs either. If you’d been the fifth person to reply on the article to ask for employment, I’d certainly have directed the comment at you also. My last comment, and reply to mjw, could be read in a condescending tone… you’re correct. I’m sorry if this offended you. hi my name is lazarus. there is a need to build a refinary in nigeria. im an ambitious student at cape peninsula university of technology who is looking for inservice training job at your company.i strive towards success and i have a passion for petro-chemistry.i would appreciated if you could let me know when there’s vacancy available for me. Best of luck with finding a position at Caltex. Unfortunately this is not their site, I merely posted a photo of the refinery here. im a looking for a job in your company i was a student in CPUT Bellville Campus studying CHEMICAL ENGINEERING but financially i didn’t finish please respond. I’m worried the people asking for jobs here would ever be let on a chemical plant… Scary stuff! Is this a meme now or something? Matthew, yes, I briefly considered that. I keep hoping that there’s some reason (besides for not reading the article) that caused the folk above to think that they can apply for a job though this site. Perhaps a total naivety regarding the web? Mjw… perhaps it’s better to imagine that someone’s messing with us. I doubt it, but if so, it’s awesome of them to have kept it up for this long. I’m a IT solution architect for large South African insurance company. Lately I’ve been thinking of changing things up and taking up a career in Chemical Engineering. While searching for a job, I found your career information portal and would like to know if Caltex HR has any vacancies at this point in time. Please let me know at your earliest convenience when I can come for an interview. If you don’t have any vacancies for Chemical Engineers at this time, I’ll take a job in your IT department. I cannot official speak for Caltex but I am empowered to do initial application vetting on behalf of intermediary Cape Town Daily Photo. The leap from insurance to chemical engineering can be daunting so it’s key for us to determine your suitability and ability to sustain long-term psychological damage. As part of your application, please submit a flow chart that answers the following question: if a wood chuck could chuck chemical bonds, where would s/he store the zinc stearate? Dear sir/madam Im current doing my S4 in chemical engineering at Mangosuthu university of technology, im looking for an in-service training in your company for next year 2014. Will you please forward me the relavent pleople’s contact details. Im looking forward to hear from you. Hi, I am a DCTC student, studying toward a National Diploma in chemical engineering, I have finished all my N(S), So nw i am looking for 2 years inservice traininng in order to obtain my Diploma. I am a hard workinga student, who loves facing new challenges in life, i have good chemical engineering theory background. Hey Nkululeko, read the thread above for useful tips on how to apply at Caltex. Good luck! pity, you couldn’t get the table top mountain in the background! Hey Paul, I’m looking for a job at Caltex…… LMAO! It’s really funny looking at these comments, sorry for derailing the subject. But honestly, if I were a Caltex recruiter, I would look at these people applying here, and question their ability at anything they apply for. Unless if it’s a joke, right? Maybe one of those job search aggregator sites that’s incorrectly listing this page as a job listing? No no, I don’t think we’ve been listed on a job search aggregator… we are pretty well ranked for “Caltex Milnerton” on Google though. im an ambitious student at cape peninsula university of technology currently i am doing S4 who is looking for inservice training job at your company.i would appreciated if you could let me know when there’s vacancy available for me. The photo is actually awesome. Thanks for posting it. These guys asking for in service training is giving us, as Chem Eng students, a bad name. They should do proper planning for their studies and they should have applied for ‘In service training’ long time ago. You’re correct, unfortunately – so thanks for your comments – hopefully you’re helping to restore some of what the guys above have tarnished. I think people reading this understand that sometimes people are just silly and for whatever reason mistake something (like this article) for what it’s not. Perhaps, in this case, it’s due to thorough and honest confusion as to how the Web works – possibly due to background and lack of exposure to the Web. If that is the case, then wow, it’s something we need to solve to give people like this a fighting chance in today’s world. In terms of photos – for sure, I understand why Sasol would prohibit folk to take photos of their buildings and equipment. I was wondering about any legal prohibition on taking photos of the structures from outside of Sasol or Chevron’s land – like the one in this post. By “legal” I mean in terms of South African law, not the issue of taking photos from within the establishment (which could be considered illegal in terms of the company’s internal policy, but not in terms of country law).